I still have a hard time grasping the concept of celebrating Thanksgiving in October. Now that we have an official Canadian living under our roof (Baby Huff), I better embrace it. Somehow we are already deep into fall and I don't even remember how we got here. The leaves outside are turning the most beautiful fiery red and we've been forced to take out extra blankets and heavier sweaters. Fall is my favourite, and I am so excited to share it with my little one (plus, he is soooo cute in his winter hat and sweat pants - hehe). As most of us are, I am all about the pumpkin spice. However, I know I am a grown-up now because I find PSL's too sweet. Yea, I have a baby and our last big purchase was a nice family couch, but I think this is the true test of adulthood, lol. Instead, I took the lovely flavours of pumpkin spice and turned them into this creamy, sophisticated treat. When developing new recipes, I usually start by incorporating seasonal ingredients, followed by paring different textures. I have an affinity for custard desserts, and just knew the creaminess of pumpkin would blend perfectly into this rich no bake pumpkin pot de creme. For a bit of crunch with each bite, crushed gingersnaps make for the perfect garnish for these little puddings. Sweetened with a bit of maple syrup and subtly spiced with warm flavours of cinnamon and nutmeg, these no-bake, individual desserts are perfect for Thanksgiving or any other upcoming holiday get together. So while I won't be cooking up a full turkey with the works for just the three of us nor will I need to bake multiple pies and treats (although I'll probably still want to), at least I know there will be something pumkin-y for my little family to celebrate with. Happy Canadian Thanksgiving! Place heavy cream and sugar in a medium saucepan. Whisking intermittently, heat over medium until the sugar dissolves and cream comes to a slight boil. Remove from heat. In a medium heat-safe bowl, whisk together the egg and egg yolks. Gradually temper in the heated cream mixture. Whisk to combine. Pour the egg-cream mixture back into the saucepan and cook over medium heat. Stir with a wooden spoon until the custard is thick enough to coat the back of the spoon, about 5 minutes. Remove from heat and stir in the pumpkin, maple, cinnamon, nutmeg, and vanilla. Whisk until completely smooth or use an immersion blender for about 45-60 seconds until thoroughly combined. Evenly distribute custard into 4-6 ramekins, jars, or other small serving dishes. Refrigerate until set, about 2-3 hours. Serve with crushed gingersnap cookies. Be honest. Who feels like turning on their oven in this summer heat? Yeah, that's what I thought. But, that should not deprive you of delicious desserts for the entire season. Solution? 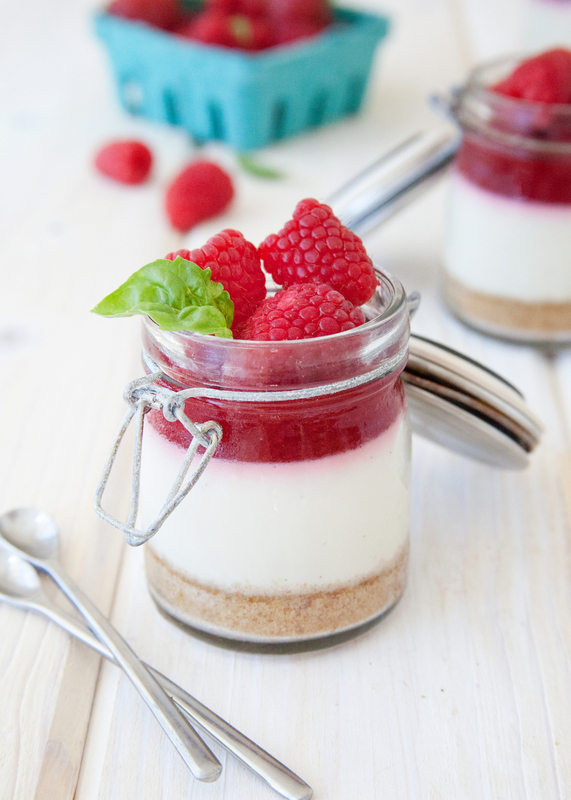 These No Bake Cheesecake Verrines! These silky, rich cream cheese custards are paired with a berry gelee, all a top a simple graham cracker crust. If you've been following the blog, then you know how much I love to pair different flavors together to create new desserts. Making verrines or trifles are an easy way to do just that. For this dessert, I've taken the compotes of a traditional berry cheesecake to create individual, layered treats. Head on over to The Kitchn for the complete recipe! So I must be the worst blogger around. It is already October 4th, and I am just now posting my first pumpkin recipe of the season. It's not that late in normal circles, but in the blogging world I'd definitely get a slap on my keyboard-clad wrists. To be fair, I actually made this recipe almost a month ago. I saved it, since I didn't want to bombard you all readers with pumpkin everything while the sun was still shining bright, but then the photos got forgotten about in the hustle and bustle of me trying to fit in as many sunny-day activities as possible before summer was official over. The truth is, you can enjoy this dessert any time of the year. Strangely enough, it was my very first icebox cake. As the name implies, it is served cold- or at least room temp. It might not warm and ooey-gooey, but the result is like pudding goodness for the soul. I am drawn to both individual desserts and large cakes alike. I wanted to make something other than traditional cake, but something that would stand high on a cake pedestal. After milling over some ideas and researching recipes, icebox cakes seemed to fit the profile. Huge bonus? They are super easy to make. I went with an unexpected flavor combination that was both unique and popular for fall. As over-saturated as pumpkin is, I have not seen a lot of pumpkin chai combinations. When I thought of pairing the two together, I did a little research. Either there are not a lot of recipes because A) the flavors taste terrible together, or B) I am truly original. Now I bet neither are completely true, but I hope the truth is closer to the latter. As summer sadly comes to a close, I am no more tempted now to use my oven much than I was at the beginning of the summer. It might not be as warm, but I'd rather spend my time soaking up the last bit of sun. Now, as you've noticed, most days I am big supporter of making everything from scratch. Today is not one of those todays. Instead let's make the cutest, little cheater torte there ever was: my Easy Summer Charlotte. Sure you can make most of the components from scratch, and I applaud who ever deicides to do so. For the rest of us, we are about to get "Semi-Homemade." Just call me Sandra Lee ;) This summer cake is not very representational of the traditional dessert on the inside, but the presentation is were it's at. The ribbon makes it immediately festive and it is a great way to finish up the last of the summer berries. Looking for something easy yet beautiful for a Labor Day party? This is it. 1. Beat the cream, sugar, and vanilla together with an electric mixer until medium soft peaks form. Set aside. 2. Place the cake round on your serving dish or cake board. 3. Using an offset spatula, spread the berry preserves on the cake. Spread a thin layer onto the sides of the cake as well. 4. Adhere the ladyfingers around the cake. Use a serrated knife to trim the last cookie to fit (if necessary). 5. Tie a length of ribbon around the cake to secure the ladyfingers in place. 6. Fill the cake with about 1 1/2 - 2 cups of whipped cream. 7. Top with mixed berries. 8. Dust with powdered sugar just before serving.